Parma earned a narrow win against third-placed Napoli to boost their hopes of European qualification for the first time since 2006. 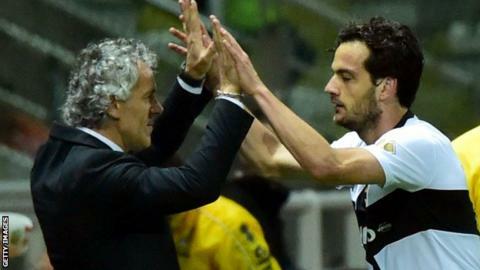 Roberto Donadoni's side ended a three-match losing streak with Marco Parolo's sweeping left-foot winner. Parolo beat Napoli goalkeeper Pepe Reina with a first-time shot from 20 yards after being picked out by Mattia Cassani's precise pull-back. Napoli rallied in the closing stages but could not force an equaliser. Colombian substitute Duvan Zapata provided Rafael Benitez's side with some much-needed attacking spark after replacing Argentina striker Gonzalo Higuain on 68 minutes. Zapata twice headed over in the final five minutes, while team-mate Lorenzo Insigne fired across goal when well-placed. Despite the defeat, Napoli are nine points clear of fourth-placed Fiorentina and still on course to seal Champions League qualification. Two-time Uefa Cup winners Parma moved into sixth - which might be good enough for a Europa League spot - and are level on points with fifth-placed Inter Milan with six games left. Match ends, Parma 1, Napoli 0. Second Half ends, Parma 1, Napoli 0. Henrique (Napoli) wins a free kick on the right wing. Foul by Gianni Munari (Parma). Substitution, Parma. Alberto Cerri replaces Jonathan Biabiany. Attempt missed. Duván Zapata (Napoli) header from the centre of the box is just a bit too high. Assisted by Lorenzo Insigne. Offside, Napoli. Jorginho tries a through ball, but Henrique is caught offside. Substitution, Parma. Massimo Gobbi replaces Raffaele Palladino. Antonio Mirante (Parma) is shown the yellow card. Attempt missed. Gökhan Inler (Napoli) right footed shot from outside the box misses to the left. Attempt missed. Duván Zapata (Napoli) header from the centre of the box is just a bit too high. Assisted by Dries Mertens with a cross. Gökhan Inler (Napoli) wins a free kick in the defensive half. Attempt missed. Lorenzo Insigne (Napoli) left footed shot from the left side of the six yard box misses to the right. Assisted by Dries Mertens with a cross. Substitution, Napoli. Goran Pandev replaces Marek Hamsik. Dangerous play by Ezequiel Schelotto (Parma). Substitution, Parma. Gianni Munari replaces Marco Parolo. Ezequiel Schelotto (Parma) wins a free kick on the right wing. Marco Parolo (Parma) is shown the yellow card for a bad foul. Henrique (Napoli) wins a free kick in the defensive half. Foul by Marco Parolo (Parma). Jonathan Biabiany (Parma) wins a free kick in the attacking half. Duván Zapata (Napoli) is shown the yellow card. Duván Zapata (Napoli) has gone down, but that's a dive. Attempt missed. Raúl Albiol (Napoli) left footed shot from outside the box is high and wide to the right. Assisted by Gökhan Inler. Marco Parolo (Parma) wins a free kick in the defensive half. Foul by Duván Zapata (Napoli). Cristian Molinaro (Parma) wins a free kick in the defensive half. Gonzalo Higuaín (Napoli) hits the right post with a right footed shot from a difficult angle on the right. Assisted by Jorginho. Attempt missed. Marco Parolo (Parma) right footed shot from more than 35 yards misses to the right. Gonzalo Higuaín (Napoli) wins a free kick on the right wing. Offside, Napoli. Lorenzo Insigne tries a through ball, but Gonzalo Higuaín is caught offside.